It can be difficult to work out if the cat is stray, feral, or simply lost. And there are various things you can do to try and work this out. For example, if the cat looks like it’s well looked-after, is well-groomed and doesn’t appear to be underweight, the chances are it’s owned by somebody close by and has either lost its way or is trying its luck for extra food. If the cat is feral, it’s very likely that it won’t want to approach you no matter how hard you try. And stray cats? They tend to look a little lost and confused but could also be friendly depending on how much human interaction they’ve had. 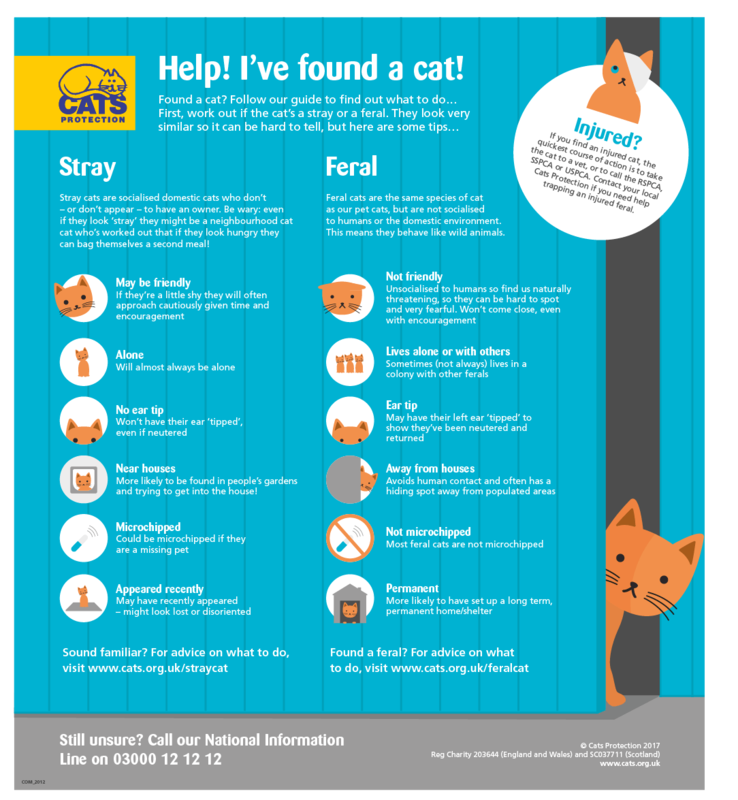 Cats Protection has a handy visual guide to help you identify any cat in this situation. But in each case, try to avoid feeding the cat. This can be extremely difficult to do when all you want to do it to help the animal. But if they have an owner, you could be doing more harm than good by overfeeding or neglecting any special dietary requirements. If the cat is particularly friendly or you’re able to get up close, check for a collar or tag to see if the cat has a name or its owners contact details to hand. If there isn’t any information, you could always try attaching a note – if the cat has a collar – to explain to its owners that you’ve spotted it hanging around and to get in touch with you. If you can’t attach a note, and you are able to approach the cat, you can also take them to your local vet so that they can scan for a potential microchip. If you live in an area where there are lots of wandering kitties, you may already have spotted posters highlighting any other lost, local cats. This can be very helpful in terms of getting the cat back to its rightful owner. Consider putting some photos up on social media groups and websites that specifically feature lost cats. If it’s been a week or so and the cat is still loitering in the same spot, you should take the stray to your local rescue centre. Many places will only accept cats between working hours of 9am-5pm but there will be some that are 24 hours. To find your local centre, try the RSPCA search service and make sure to contact them before you head there. But in order to undertake this step, you’ll first need to try to catch the cat. This can be tricky, especially if the cat is reluctant, so you can try to create a barrier using clothing or something similar. Make sure to do so slowly so that the animal doesn’t become threatened. You can also try to entice the cat with food simply for capturing purposes. Place it on the floor and allow the cat to slowly come up close to it. Once safely secured, you can make your way to the rescue centre. And if you wish to take care of the cat? This is the most important question you’ll need to consider. If the stray cat is injured or hurt in any way or requires ongoing medical care, you may be left to foot the bill if you take on ownership. So, it’s important to assume all responsibility if you decide to keep the cat. It’s also important to consider that the cat may already have an owner and you’ll have to give the animal back even if an attachment has been formed. This can be especially hard. And don’t’ forget to update any websites and take down any posters if you do find the original cat’s owner. I have 2 cats and I am wondering if I should let them outside in the winter? Will they get hypothermia or pneumonia? What do I do? Previous Post Small Pets for Kids – Which are Most Suitable?